The 3 M's of Fat Loss | Eat, Train, Thrive! Weight loss and fat loss are often used interchangeably, but they are not the same thing. Weight loss, for example, is the loss of fat-free mass (muscle) and fat mass, fluids (water), etc. The primary focus here is to get the scale weight to go down; nothing else matters, even if you lose your soul doing it. Gaining fat and losing muscle is what happens when you continue to yo-yo diet. Fat loss – loss of fat mass (reduction of body fat) while maintaining muscle mass (fat-free mass). You see, when it comes to fat loss, less is better, not more. The more extreme the approach, the harder the rebound. The slower the loss, coupled with less extreme measures, will result in long-term, lasting change. Rebound or bounce back means you gain weight back again, plus some. I will always educate and want to set my clients up for success. You want to lose fat while still eating adequate calories (even if you don’t count calories, calories are still present in your food). You will want to be still eating as much food as possible, not a birds worth, lol! Fat loss is achieved through a calorie deficit. 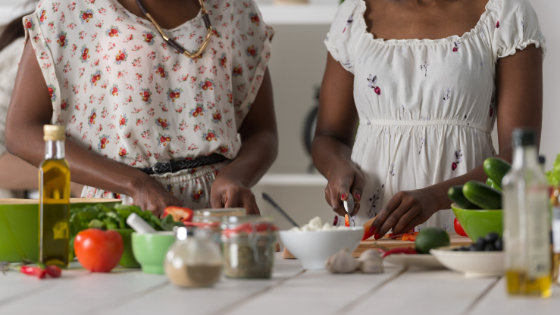 Just about any diet out there will give you a deficit, however, these diets either eliminate whole food groups or extremely deprive you. In addition, they don’t take into consideration your unique psychological or physiological makeup, personal preferences, etc. None of that matters to the diet or to the folks that created said diet; the goal is to get you to lose weight quickly by any means necessary, so that they can keep you coming back for more. So, what matters most, first and foremost, is a calorie deficit – but a modest one, not an extreme one. For example, it is very unwise to slash your calories really low – remember more is not better. As simple as it sounds, there is more to it than calories in and out! But that’s a blog for another time. What else matters to fat loss is Muscle, Metabolism, and Measurements. Let’s start off with the importance of Muscle. Muscle is not just for aesthetic reasons. It helps our metabolism work efficiently. Quite frankly, the more muscle you have, the better your metabolism will run. The less muscle you have, the slower your metabolism will probably run. During a fat loss phase, it is crucial to maintain your muscle, or even possibly gain some, if you are a newbie to lifting. The goal is to lose the fat and retain the muscle so that at the end of your deficit you are in a good place metabolically and not just a smaller version of yourself with no new shape. See, if you eat too little during a loss phase, you start to diminish your muscle and fat loss comes to a screeching halt. The body wants something to eat; it will save the fat for last to attempt to maintain homeostasis. Often, the body will take the muscle first, as it takes more calories to maintain muscle. Maintaining your Muscle is crucial during a fat loss phase. Is the set of life-sustaining chemical transformations within the cells of living organisms. The three main purposes of metabolism are the conversion of food/fuel to energy to run cellular processes, the conversion of food/fuel to building blocks for proteins, lipids, nucleic acids, and some carbohydrates, and the elimination of nitrogenous wastes. Simply put, the metabolism is our furnace and it processes the food that we eat to help us live and function. Our metabolisms do change over the span of our lifetime because of aging. However, we can keep running better by not dieting and preserving as much muscle as possible. You’ve probably heard me say this many times now; Muscle equals Metabolism. The more muscle you carry, the better the metabolism works. Muscle is metabolically active and wants you to feed and treat the body right. So, if you have never lifted any weights or done any external type resistance training in your life then you only have the muscle that you were born with. As we age, muscle diminishes fast, especially if you have never done anything about it. Ladies, running does not build muscle. I am sure that you noticed now that you have to run and run to “try” and keep your weight down and eat very little. You have no muscle. Therefore, your metabolism is slower. Start resistance training #LiftTheThings, lay off all the running and eat enough to sustain and to build muscle. You can thank me later. Let’s talk the other M of Fat Loss! Measurements my friends! Not the scale. The scale is one teeny tiny measure of progress. Unlike the scale, taking your measurements at your breast, waist, and hips will show that you are losing fat. Whereas the scale just shows a decrease in weight. That number could be coming from anywhere. It can also go up, which trips people all the way up. If your weight is staying the same and the measurements are going down, you are losing fat and gaining some muscle. No need to be alarmed, the scale weight doesn’t tell the whole picture. Losing fat and gaining/maintaining muscle is what you want! This is more sustainable than chasing the scale number. When the focus relies just on the scale, this where you will get sucked down the vortex. It no longer becomes about health, but about an arbitrary number that doesn’t mean you are getting healthier. It just means you are losing weight and it could be that you’re losing precious muscle. This a big no-no! So to summarize things up a bit! While in a fat loss phase, it is crucial to maintain as much muscle as possible. Don’t bottom out your metabolism through extreme dieting. This goes back to the importance of building or maintaining your muscle. Your metabolism will run like a boss if you have adequate muscle and feed yourself properly. When looking at your progress for physique changes, use body circumference measurements to track progress. That’s it, folks, mind your muscle, your metabolism, and your measurements. Lastly, don’t diet! It is doing more harm than good. Need help navigating all this noise on body change and fat loss? I’ve got you covered! 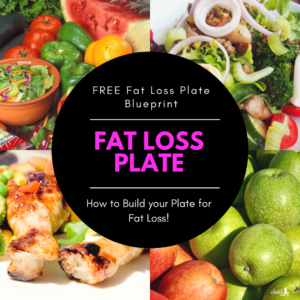 Grab my Fat Loss Plate Blueprint below! Discover how to simplify Fat loss. Fat loss doesn’t have to be so restrictive.